Discussion in 'Member Video and Sound Clips' started by ghisi, May 5, 2008. Still lovin' the guitar? I have one on order with Nick and it should be done mid June or so. Just wondering if the guitar is showing any specific strengths or weakenesses. OH YEAH...you're puttin' the hammer down on that. Guitar has the same 'semi hollow illusion' that i like about my VA. Better music than I hear on alotta 'records' these days...good job. Sweet tone and playing on that first bridge clip. Are the headstocks unlabelled on these relics? Yep ... Nick will not put a logo on the headstock. You've got to buy one elsewhere and put it on. I love my Rocketfire Strat. It's been my number one ever since it arrived. Nick's pickups are absolutely AMAZING sounding. on that first bridge clip. Thanks, they are really nice looking relics. Might send him an email. Yes, I am still in love with the guitar. It is a natural complement to my Suhr Classic, with realistic vintage look, feel and tone. And the response and tone of the pickups are beautiful, as Deacon said. I appreciate it. I stay up many a late night winding these darn pickups! Maybe someday I can teach my kids to help me with it. It's so easy a kid could do it. The sound is nearly all in the wind pattern. 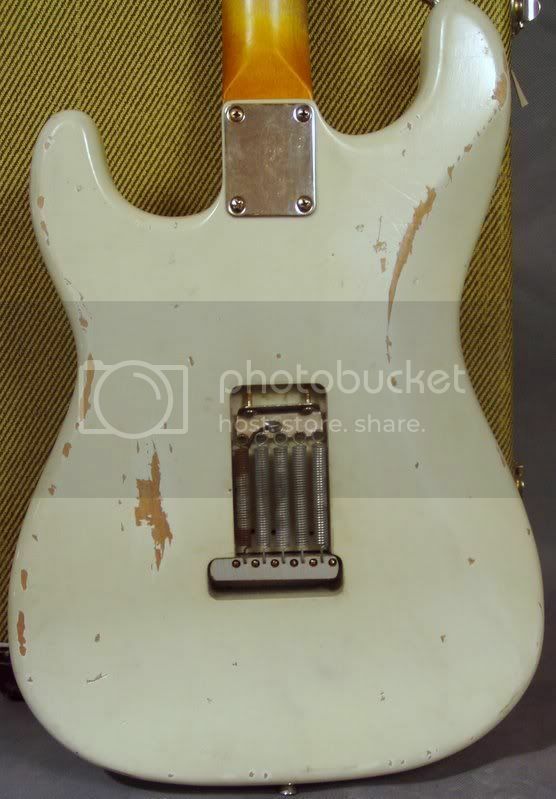 What's really amazing is that the people who wound the 1950's and 60's originals at Fender probably could have cared less about guitar or even music and they're worth 3 grand a set now! Who'd have figured. There's definitely an art to it but it's not rocket science. Enjoyable work really. I'm thankful to be doing this. Feels good to offer something I'm proud of! I'm glad you guys are enjoying my hard work! Doug, I still love that olympic white. I'll buy it off you! Just kidding, my wife would kill me if I buy another guitar. I've got enough guitars for about 8 or 10 bands! Anybody need one! 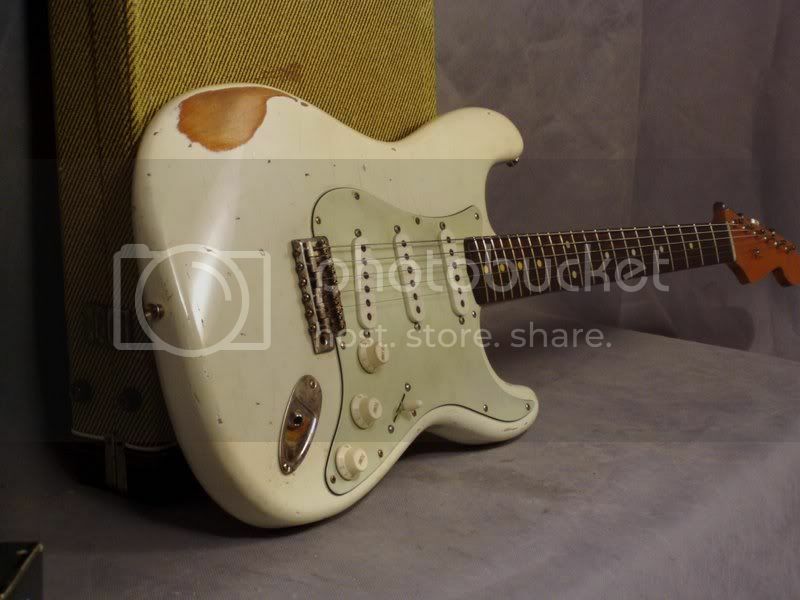 very nice tone and playin - sweet looking 'Worn' strat too. Ghisi, care to describe the complete signal path on that neck clip? Great tone. Guitar => Toneport UX1 using Gearbox Software simulating Vibroverb amp (Classic Pack). +1 on Nick's pickups !! I've put them in EVERY strat I've built and EVERYBODY, without fail , have commented on the pickups !! Sounds great! Soulful chops! How much do these Rocketfires run? I did a demo on here of RF 60's PU's. I swear by them. They are my favorite pickups. A relative of mine has a '59 Strat that doesn't have the original pickups. I'm hoping to snag it one day and THESE are what's going in it!